China's first large jetliner has successfully completed its maiden flight, a key moment in the country's push to challenge the U.S. and Europe as a global manufacturer. The C919, China's first domestically designed and built large airliner, took off Friday afternoon from Shanghai Pudong International Airport into hazy skies with a five-person crew aboard. The jet landed one hour and 19 minutes later after a seemingly uneventful first trial. With the flight, China joins the ranks of the few nations that have developed homegrown large airliners: the U.S., Russia, Brazil, Canada, the U.K., France and Germany. 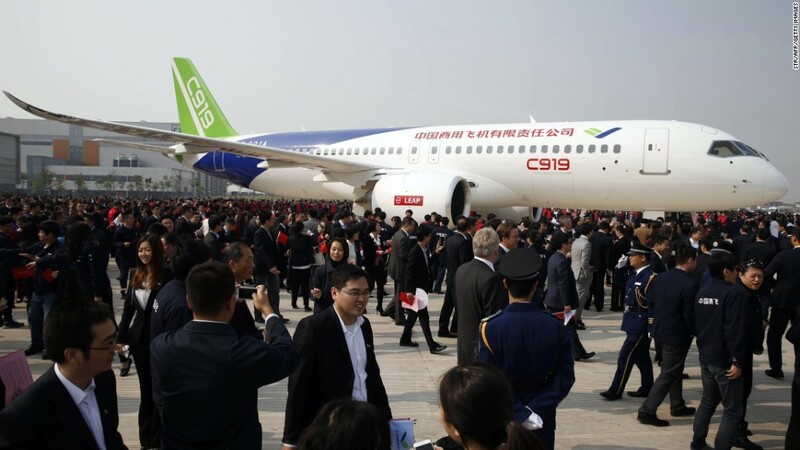 Made by the Commercial Aircraft Corporation of China (Comac), the 168-seat C919 is roughly the same size as Airbus's A320 and Boeing's 737-800, which are the most popular airliners in the world. The C919's maiden flight was watched by people around the globe, including at least 2 million on Chinese microblogging platform Weibo. Comac also offered an unprecedented look inside the maiden flight of a new airliner. The company streamed live images from the jet's cockpit looking over the shoulder of its test pilots as they performed gentle maneuvers off the coast. Neither Boeing nor Airbus has ever provided a live view of the cockpit on a first flight. The Chinese jet's first flight is the biggest and most visible milestone in its development. But it still has a long way to go before it's carrying passengers and competing with its U.S. and European competitors. The start of aerial testing kicks off months or years of grueling certification tests, and meeting safety standards might require design changes. Comac will also need to win the trust of airlines in China and elsewhere by proving the jet can operate efficiently and reliably on scheduled flights. However, the milestone marks another key achievement for China on its ascent to challenging the west and cultivating its aerospace ambitions. The country is already an adept designer of military aircraft, but has sought to catch up to Boeing in the U.S. and Airbus in Europe in manufacturing civilian airliners. The C919 prototype was unveiled in November 2015. So far it's been slow-going. The country's state-owned airlines first signed up to buy the jet in 2010, and it was originally supposed to enter service in 2016. The prototype wasn't unveiled until November 2015, and the project has been beset by technical delays as China learns the ropes of airliner development. Comac, a state-run enterprise, has partnered with western suppliers for nearly all the jet's major systems to share technology and learn how to mass produce an airliner. The C919's main customers will be China's domestic airlines. 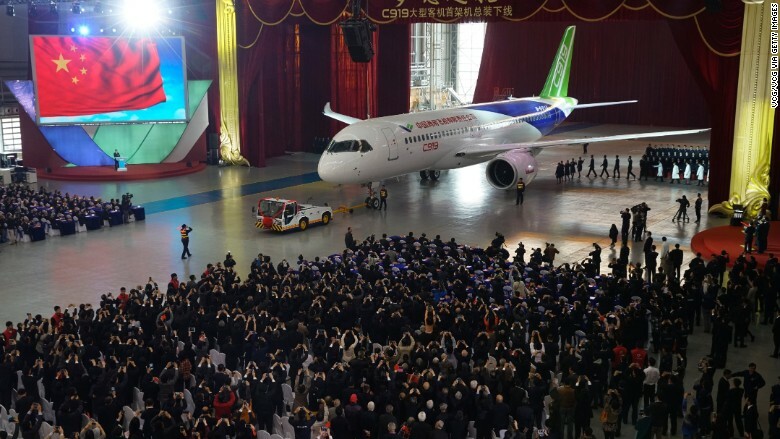 China Eastern Airlines will be the first carrier to operate the C919 when it completes testing and secures approval from China's aviation regulator. China is on track to surpass the U.S. by 2030 as the world's largest commercial aviation market. 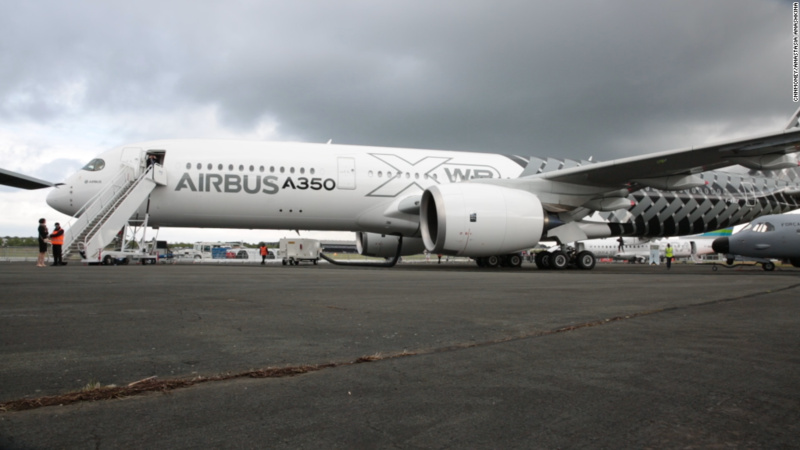 Chinese airlines are buying hundreds of Boeing and Airbus jets to grow their fleets. Boeing estimates that the country will need a trillion dollars worth of new airplanes over the next two decades, including more than 5,100 of the same size as the C919.